Monte Carlo algorithms have diminishing returns on the number of samples. To cut the amount of noise in a rendered image in half, it can commonly take four times the number of samples. RenderMan ships with a new tool that offers an alternative approach to reducing noise in rendered images. This tool was originally created by Walt Disney Animation Studios and Disney Research for Big Hero 6 and as a result has already been tested and proven in feature film production. Using the denoising tool from RfM is fairly straightforward. 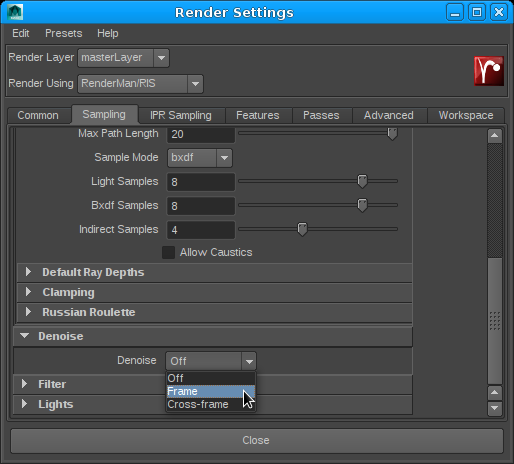 The Sampling tab under Render Settings now contains a drop-down from which you can select Frame or Cross-frame filtering. Choose Frame and RfM will automatically apply the settings needed to produce a denoisable image. This will execute the tool as a post-process and removes noise through statistical filtering on specially configured EXR images. Since this is applied as a post processing tool, you are required to batch render the frame to automatically generate denoised files. It's not currently supported in interactive rendering. 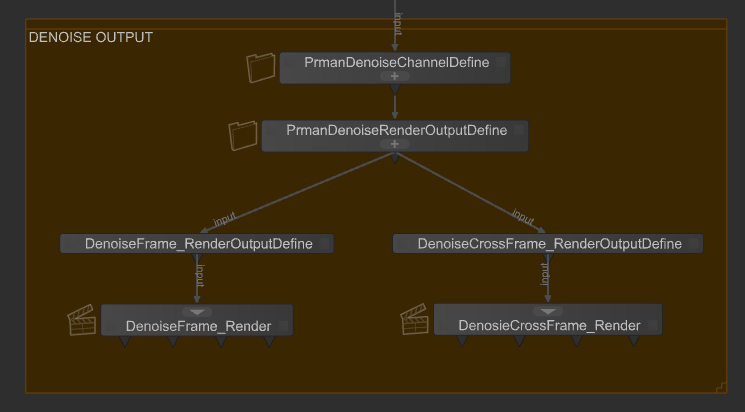 We need to set up a few nodes for running the denoise utility as a post process. 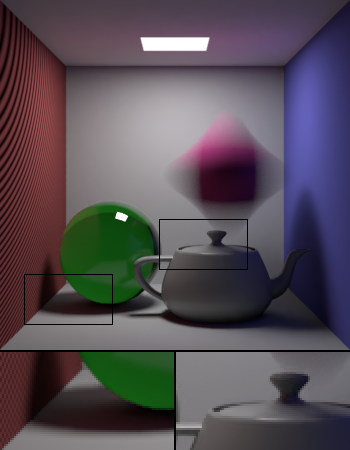 Turn on importance sampling for the raytrace hider's pixel filter mode. This will eliminate splotchiness in the render. 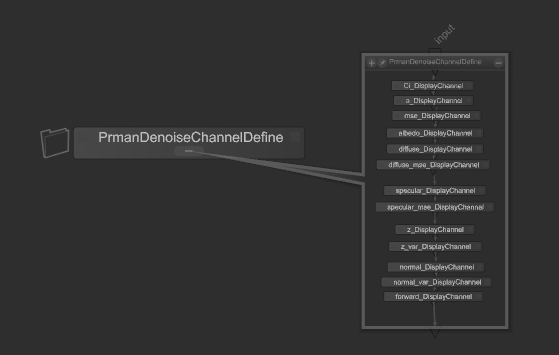 Create a PrmanDenoiseChannelDefine node which is a macro for creating all the specific DisplayChannels required for the denoise utility. Create a PrmanDenoiseRenderOutputDefine node which is a macro for rendering a multichannel OpenEXR file for the beauty pass combined with the AOVs. If your pipeline does not support multichannel EXR, you can use $RMANTREE/bin/exrmerge to combine the AOVs into a multichannel EXR. Then use this merged multichannel EXR for the denoise utility. Note that each AOV's type should be set to "raw" because this preserves the channel name in the EXR which the denoise utility will look for. 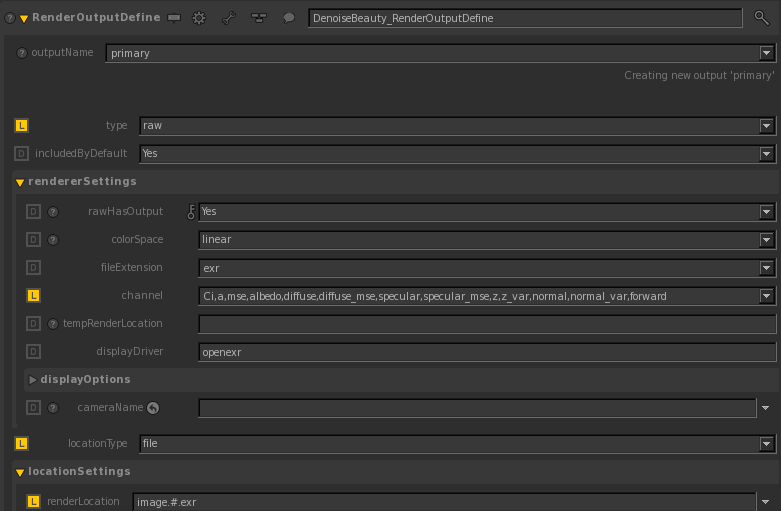 Combined EXR using Katana's RenderOutputDefine's merge will not work with the denoise utility. By default, it will write out <image>_filtered.exr. This can be changed by specifying -o. Run denoise -help for more information on other denoise utility options. Users must run a disk render in order to denoise an image. Denoising is not currently supported in interactive rendering. NOTE: We can run the denoise utility for AOVs. See Layered Filtering for more information. DisplayChannel "color mse" "string source" "color Ci" "string statistics" "mse"
DisplayChannel "color albedo" "string source" "color lpe:nothruput;noinfinitecheck;noclamp;unoccluded;overwrite;C(U2L)|O"
DisplayChannel "color diffuse" "string source" "color lpe:C(D[DS]*[LO])|O"
DisplayChannel "color diffuse_mse" "string source" "color lpe:C(D[DS]*[LO])|O" "string statistics" "mse"
DisplayChannel "color specular" "string source" "color lpe:CS[DS]*[LO]"
DisplayChannel "color specular_mse" "string source" "color lpe:CS[DS]*[LO]" "string statistics" "mse"
DisplayChannel "float z" "string source" "float z" "string filter" "gaussian"
DisplayChannel "float z_var" "string source" "float z" "string filter" "gaussian" "string statistics" "variance"
DisplayChannel "normal normal" "string source" "normal Nn"
DisplayChannel "normal normal_var" "string source" "normal Nn" "string statistics" "variance"
DisplayChannel "vector forward" "string source" "vector motionFore"
DisplayChannel "vector backward" "string source" "vector motionBack"
The denoise utility expects a multichannel OpenEXR with the exact channel names given here. Light Path Expressions are used to separate the diffuse and specular components and to retrieve the unlit albedo colors for the materials. The statistics parameters are used to request that prman produce images that estimate the variance or the error in the linked image. The forward and backward channels are not strictly necessary here, but become useful when filtering image sequences with motion blur. For the albedo, U2, or user lobe 2 is the default routing for albedo from the standard Pxr materials. The actual number is determined by the rendermn.ini file and can be changed to anything from 1 through 8 if your site uses custom shaders that assign LPE lobes differently. Where 0 is off (default). This is an experimental option. Note that the filter specified on Z and z.var should match the choice of PixelFilter used. Normally, Z channel output in RIS defaults to using the "min" filter instead of a pixel filter. However, the denoiser expects the Z channel to be pixel filtered just like any other channels. The final key setting here is to turn on pixel filter importance sampling on the raytrace hider. Normally a sample through one pixel is shared among its neighbors and blended into all of the pixels covered by the filter region around the sample. This can be beneficial for getting quick feedback in IPR and letting images converge a little more quickly. However, the denoiser expects that each pixel is statistically independent from all others and that no samples are shared between pixels. If you forget to enable this option, the denoiser will usual produce overly splotchy images after filtering. This will produce a new file, image_filtered.exr, with the filtered image. If you have multiple image files, you may pass them all on the command line and the denoiser will filter each file in turn. For animation sequences, the denoiser can be set to a cross-frame filtering mode where the filtering for each frame also takes into account the pixels from the frames immediately before and after. 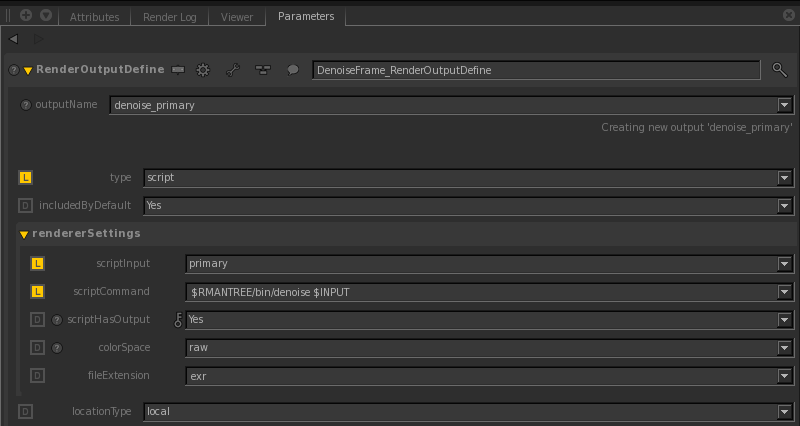 To enable this option in RfM, simply choose Cross-frame filtering from the denoising drop-down box instead of Frame and render your sequence. By default, it will write out <image>_filtered.#.exr. This can be changed by specifying -o. See denoise -help for more information on other denoise command options. The -F and -L options ask the denoiser to use the first and last of the given images, respectively, when doing cross-frame filtering but not to actually denoise those images themselves. Thus using -F and -L with frames 2, 3, and 4 will filter and write frame 3 only, though it will use frames 2 and 4 to do so. The first and last executions of denoise here are the exceptions in that they are set to filter two frames at a time. In any event, when run this way the denoiser will always be working one frame behind the rendering. The master image that contains all of the common channels (configured as above for the basic denoising) must have a file name that ends in either _variance.exr or .variance.exr. These may be optionally suffixed with a number from 0 through 499 to distinguish the different passes for a frame. Combined diffuse and specular components can also be placed in matching channels named emission (e.g., directdiffuse17 plus directspecular17 in directemission17), in which case the denoiser will also produce the filtered summation. Note that the number of files and their order must match. The denoise utility divides the non variance images by the number of variance images to determine how many sets there are. For instance, in the example below, the number of files for diffuse_key and specular_key and their order are the same. The denoise sees two sets: diffuse and specular.